This program reduces parking expense by 50% of the hourly rate. Businesses can sign up for this progam or individuals may purchase these coupons from the Bismarck Parking Authority main office located at 114 N. 6th Street in Bismarck. The Park Smart program allows business to encourage customers to shop in the downtown area without worrying about any additional expense for parking. Several business downtown participate in this program. 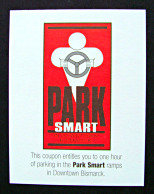 The UND Center for Family Medicine also provides Park Smart Coupons for their patients. A participating business does not incur any upfront expense when signing up for the Park Smart Program. The only initial investment required is the time it would take to endorse the back of each coupon with their own business logo. At the end of each month, each business is billed for the coupons its customers have redeemed as payment for parking in the ramp. 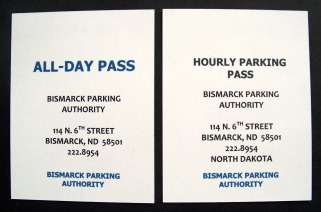 There is no expiration date on these coupons and they may be used at any of the three parking ramps the Bismarck Parking Authority manages: 3rd & Main Street, 6th & Broadway Avenue, or 7th & Broadway Avenue which is the ramp attached to the east side of the Radisson Hotel. The Park Smart Program is a great way to reduce the low hourly rate of $1 by 50% for anyone looking for shelter for their vehicle during a summer storm. Coupons have to be purchased in advance during week day hours of operation, 7 AM - 6 PM, and cannot be sold through the cashier window when exiting the parking ramp.